Lourd Ernest Hanopol de Veyra is many things at once: front man of the band Radioactive Sago Project, TV personality, poet, award-winning writer, blogger, and now, author. His two-year-old blog This is a Crazy Planets has gained a large following on SPOT.ph, and his best works are now compiled in a book of the same title. With Lourd’s various entries on everyday life’s absurdities, This is a Crazy Planets mirrors Filipino pop culture in a way that is both humorous and endearing. I’ve only heard about Lourd De Veyra through friends, because most of my friends are big fans of him. I’ve seen him every now and then on his TV5 segment, Word of the Lourd, and I have read some of his articles in his Spot.ph blog. But I was never really one who followed his stuff regularly. I wasn’t really 100% excited to attend his book launch when I was invited, except that I can’t really say no to a free, local book. Unfortunately, the launch happened on the night that tropical storm Falcon made an ocean of Manila. I was glad when the publisher still sent me a book for review because despite my being a not-so-much-of-a-fan, I was curious about the book. I was pleasantly surprised when I saw how nice the book looked. Okay, it wasn’t just nice, it was quite beautiful for a local publication. My fellow bloggers and I often complain about the print quality of the local books here, but The Best of This is a Crazy Planets is far superior than the others. The paper quality is nice, the cover design is pretty and illustrations/artwork were there for every article. I am delighted to see that it was affordable for its quality, too – P195 (less than 4 USD) is a pretty good price to pay for a book that looks this pretty. That price is even more justified once you read what’s inside. Like I said, I’ve only read a few of Lourd’s articles online, so I was pretty new to his writing. Lourd De Veyra offers a funny, oftentimes sarcastic but very real commentaries on Philippine current events, people, culture and even showbiz. I found myself giggling and having to hold it back whenever I’m reading this in a public place. Some of them, I can’t really relate to, some of them, I agree with, some of them, I just find really, really funny. Underneath its wit and sarcasm, Lourd’s articles show a lot of truth in the current state of our country. It’s not always pretty, and sometimes I feel bad when I realize that it is the ugly truth about the Philippines. But even so, Lourd never ever showed a hint of not liking his home country despite this truth (at least, that’s the impression on me). It’s like he writes it all out, shrugs and then says, “This is a crazy planet.” Or planets. Why buy this book when you can read it online? Well, if you’re not enticed by the beautiful quality of this book and its relatively cheap price, think of it this way: you can read his articles even without Internet, even if you’re in the remotest areas in this crazy planet we live in. And I think that’s pretty much worth it, right? 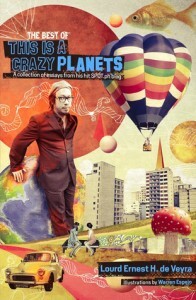 The Best of This is a Crazy Planets is now available for Php195 in local bookstores nationwide.